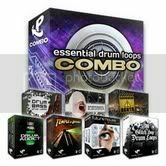 Over 1GB in weight, Essential Drum Loops Combo Pack is a selection of Prime Loops’ best-selling Drum Loops Sample Packs, with 850+ Professional Drum Loops at a special discounted price. This new 2GB Instrumental Music Loops Combo Pack is a comprehensive selection of Prime Loops’ best-selling Instrumental Music Loops Packages with over 800 Loops, covering a broad range of styles. This collection is totally exclusive to Prime Loops, and gives you a large discount.